When people ask where they should start with Italy, my answer is always Rome. In fact, I think Rome is the perfect place to start if you've never been to Europe. There's something special about the energy in Rome. I think it's a combination of the ancient ruins and beautiful masterpieces hidden around corners coupled with the warmth of the people and the deliciousness of the food. You can't help falling in love with the beauty and energy of the Eternal City. Rome is known as the Eternal City because ancient Romans believed the city would stand the test of time...and this philosophy continues to hold true. Rome also happens to be one of the most popular tourist destinations in the world, attracting people to see its ancient ruins, shop in its luxury stores, and over-indulge in some of the best food. While I had been to Rome before, Dan had never been to Italy when we moved to Dublin last March. I made it my business to show him my favorite country over the course of our year abroad, starting with Rome in April of last year. In fact, our quick trip to Rome was our first one out of Ireland (not counting Northern Ireland...more on that complexity in a future post). In this post, I'm going to share how to see Rome in four days. I think 3-4 days is the appropriate amount of time to see the best of the city. Dan and I happened to also have befriended two Italians, specifically from Rome, who both have shared their favorite local spots...they're all included in this guide. Everyone should go to Rome at least once in their lifetime to fill themselves silly with pasta and then walk it all off in time for a late afternoon gelato followed by a spritz. Even if you've been, there's always more to explore and layers to peal back. By the end of this post, you'll be singing love songs to Rome and dreaming of fresh spaghetti pomodoro. In this section, I'm offering suggestions on what to group together by day. You can see everything visually on the map I created below. In full disclosure, we went to Rome before I was in blogger mode and we have limited pictures of the attractions without embarrassing selfies. Special thanks to my friend Daphna who generously shared a few of her pictures from her recent trip. Rome is one of the best cities in which to simply wander. You never know what incredible piece of history you'll uncover around every corner. Depending on what time you arrive, take yourself on a walking tour of the city to see some of the famous piazze (central squares), statues and fountains, and beautiful views. + Head to Trastevere for dinner at Popi Popi. + If you're looking for a night out, join the crowds on the streets in Trastevere. Start at Piazza Trilussa and follow the crowds. Lose yourself in the streets (no open container laws in Italy!). Make sure to check out Bum Bum di Mel for a huge Caipirinha with fruit. You absolutely cannot go to Rome without seeing the Colosseum, Roman Forum, and Palatine Hill. Prepared to be amazed by the ancient world as you walk through the ruins. I think going on a guided tour is the best way to see the sights. You're going to want a tour guide to make the ancient world come to life. After your visit to the big three, take yourself on a walk to find the best artichokes in the city. + Walk from your accommodation to the Colosseum for your tour of Ancient Rome. Depending on where you're staying and the time of your tour, you can take a longer route to find more gems around the city. We started from Piazza Barberini and walked up the hill on Via Quattro Fontane to see the Four Fountains. From there, we meandered through the streets and made our way to our tour meeting spot. + I highly recommend this tour on Viator, so you can skip the lines and also see the underground chambers where the animals were held at the Colosseum. We booked the 12:45pm tour knowing we were going to be out late the night before. The tour lasts around 3.5 hours. + After the tour, walk along Via dei Fori Imperiali and look out for the ruins on both sides of the street. 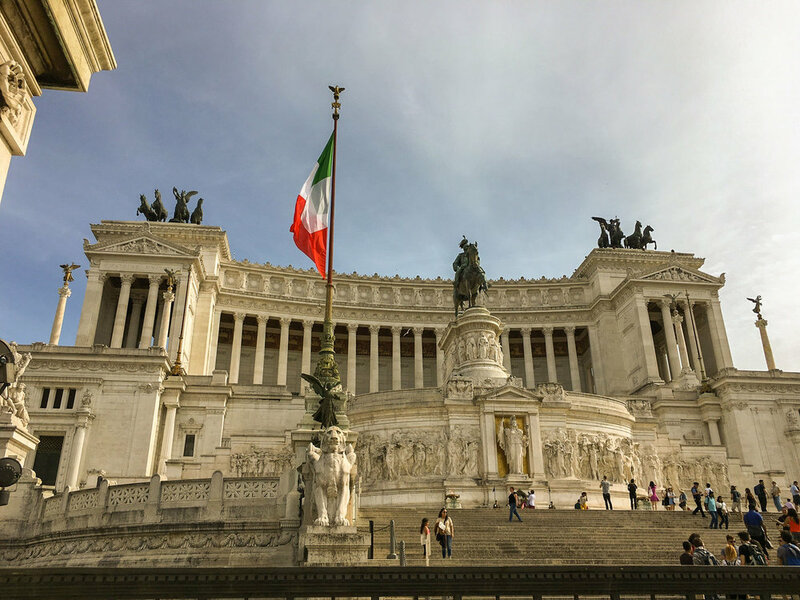 + At the end of the street, you'll find yourself at Piazza Venezia. Here you'll see the Monumento a Vittorio Emanuele II. I've heard there are great views of all of Rome from the top of the building. Let me know if you check it out! + From Piazza Venezia, make your way to Ba'Getto in the Jewish quarter for a late lunch. Make sure to order the artichokes! + Enjoy the late afternoon light as you walk south along the Tiber. Make your way to Giardino degli Aranci and Aventine Hill for amazing views over the city at sunset. + Head back to Trastevere for dinner! Maybe for pizza this time at Dar Poeta. Some of the most beautiful art in the world is held in the Vatican Museums. Beat the crowds and take an early morning tour of the Vatican Museums, St. Peter's Basilica, and the Sistine Chapel. Then spend the afternoon exploring a new area of Rome. + Take the subway or a taxi to the Vatican for your early tour. We went with this one on Viator. You can spend days exploring the Vatican Museums alone. I thought this tour was the perfect way to learn about the highlights rather than get lost in the galleries. You'll also get to see Michelangelo's Creation of Adam and The Last Judgement on the ceiling of the Sistine Chapel and his Pietà in St. Peter's Basilica. The tour lasts around 3 hours. If you're up for it, you can climb to the top of St. Peter's Basilica after the tour for amazing views overlooking the city. We were pretty tired at this point, so decided to skip. + Walk back across the Tiber via Ponte Sant'Angelo. You'll see Castel Sant'Angelo as you approach the bridge. The building was commissioned by the Emperor Hadrian and once used as a fort by the Pope. It is now a museum, which you can visit if you choose. + After your busy morning, take it easy in the afternoon. Go for a long lunch near Piazza Navono. + After lunch, make sure to stop at Frigidarium for a gelato. + Then make your way to the Pantheon. + If you need an afternoon pick-me-up, you must go to Sant'Eustachio Il Caffè for some of the best coffee you've ever had. + Go to Felice a Testaccio for some of the best traditional Roman food in the city. Before your flight, spend the morning walking through the Villa Borghese park and visiting the Galleria Borghese, one of my favorite art museums, to see gorgeous Bernini sculptures as well as other magnificent pieces. + After the museum, explore the park and then it's time to shop before you leave! You can't go wrong with all Italian food in my book. That being said, each region in Italy is known for its specialties. Here's a list of the must-try dishes in Rome. > Penne all'Arrabiata - penne pasta with a spicy tomato sauce...don't worry, it's never too spicy. > Cacio e Pepe - a thin spaghetti pasta with cheese (Pecorino Romano) and black pepper only. > Carbonara - spaghetti pasta with eggs, cheese (Pecorino Romano), bacon (guanciale or pancetta) and black pepper. > Supplì - a fried rice croquette typically filled with mozzarella cheese and covered with bread crumbs. > Bruschetta - toasted bread with olive oil, garlic, fresh tomatoes, and basil. > Strutto - pig lard. Can be spread on bread and served as a type of bruschetta. > Carciofi - artichokes in all forms. Make sure to try deep fried (alla giudìa, meaning Jewish style) and alla Romana. > Gelato - ok not Roman, but at least one cone per day is essential. If you are lactose intolerant, order the cioccolato fondente and/or extra noir. You can't really have a bad meal in Rome. A general rule of thumb is to avoid restaurants directly in tourist areas. Here's a list of my favorite restaurants as well as those recommended by my Roman friends. I will suggest, however, that sometimes it's best not to always have somewhere in mind when eating in Rome and to simply just find a place down a side street that catches your eye or your nose. > L'Archetto - a spaghetteria with infinite options near the Trevi Fountain. Go for lunch and try to sit outside. I still dream of their spaghetti pomodoro and antipasti bar. DO NOT MISS THIS ONE! > Frigidarium - amazing gelato near Piazza Navono. Get the hard chocolate shell. You won't regret it. > Popi Popi - an excellent dinner spot in Trastevere across the Tiber. Dan and I found this restaurant while looking for dinner in the area. It was packed on a Friday night with locals. You can try all the traditional Roman dishes here. > Forno Campo de' Fiori - for a quick pizza snack during the day. You can never have too much pizza. > L'Antica Salumeria - for lunch near the Pantheon. Also great cookies if you just need a snack. > Sant'Eustachio Il Caffè - for the best caffè in Rome. Also near the Pantheon. Pay and order with the cashier. I recommend getting an espresso to try the real thing. Simply ask for a caffè. Then take your ticket and give it to the barista at the bar. Drink it standing up like the Romans. > Navona Notte - supposed to be amazing pizza, via my Roman friend, but we didn't make it sadly. > Felice a Testaccio - the best of Roman food, again from my Roman friends. A bit further out, so we didn't make it here either. Supposedly the best Carbonara in Rome. > Ba'Ghetto - for those artichokes in the Jewish neighborhood. Go for lunch! Hotels are notoriously expensive in Rome and Dan and I weren't thrilled with the Airbnb options when we looked last April. Instead, we found this great small hotel in a perfectly central location right off Piazza Barberini. I highly recommend La Piccola Maison if you're looking for an affordable, basic, yet clean option. Plus, the staff is wonderful and they offer a cash discount. If you're looking to splurge, consider staying at the Hotel de Russie off Piazza del Popolo or the forever classic Hassler at the top of the Spanish Steps. Rome has two major airports: Fiumicino (aka Leonardo da Vinci) and Ciampino. You'll most likely be coming into Fiumicino unless you are flying a budget airline from within Europe (such as Ryanair or easyJet). From Fiumicino: buses (45 mins) and trains (30 mins) to Termini, the main train station, are most popular. From there, you can take a subway to your destination. You can also take a cab for a flat rate of 48 euro directly to your accomodation. Here is an excellent guide from TripAdvisor. From Ciampino: we took a Terravision bus to Termini and then switched to the subway. There are a few companies that connect Ciampino to Rome, so it's advised not to pre-purchase tickets, but instead to see which company is leaving soonest. Make sure you have cash for the bus! Figure around 6 euro per person. If taking Terravision back to Ciampino, the pickup is on Via Giolitti at Termini. If you have large bags, I would suggest simply taking a taxi because navigating through Termini is never easy (30 euro flat rate). Always confirm the price with your driver before leaving. Around the city: we walked most places except took taxis at night to cross the Tiber to Trastevere. The subway is easy to navigate. We took the subway to our early morning tour at the Vatican. Make sure you have cash for subway tickets if you do not have a chip and pin card (I'm looking at you Americans). > Rome is always busy! Avoid going in June and July when the city is extra crowded and very hot. Rome (and a lot of Europe) closes down in August for vacation. I suggest going in the spring, April and May, or the fall, September and October. > Book your tours before you go to avoid disappointment. You MUST book tickets to Galleria Borghese at least a week in advance, if not more. You can do so here. > Bookings are always recommended for dinner if offered. That being said, even if you call and they tell you there isn't availability, I've found that if you show up at the restaurant around 9:30pm, you'll usually get in even if you have to wait a bit. Be open to later dinners in Italy! > Sit out on a piazza and enjoy an aperitvo, specifically an Aperol Spritz, before dinner...the BEST! > You can never go wrong with ordering the house wine. My favorite Italian red wines are Chianti, Montepulciano d'Abruzzo, and Primitivo di Manduria. > Pizzas are served as whole pies that you eat with a fork and knife. > Romans love to eat family style. It's customary to order multiple dishes and share! > Menus are typically divided into four sections: Antipasti (appetizers), I Primi (first course, pasta), I Secondi (second course, main dishes), and Dolci (desserts). You can order a Primo as your first or main dish. You can also order a Primo as an appetizer to share. I'm a huge fan of antipasti platters filled with delicious grilled vegetables. > Wear comfortable sneakers! My feet literally burned for two days after we got back from Rome because I didn't wear supportive enough shoes. We walked around 30,000 steps a day on those cobblestones. > If you choose not to take a tour of the Colosseum and Roman Forum, you can purchase tickets online here. If you forget to purchase tickets beforehand, start at the Palatine Hill or Roman Forum because the lines are typically shorter. One ticket gives you access to the Colosseum, Roman Forum, and Palatine. You can also look into the Roma Pass. > You must have cash! While most places take credit cards, you'll want cash for quick snacks, drinks, and bars. > Visiting the Catacombs of St. Callixtux is another activity to consider. This site was the official underground cemetery of the Church of Rome. I remember going as a child and finding it fascinating. More info here. > If you only have 3 full days, you can easily fit in the Galleria Borghese in the afternoon after the Vatican. Dont' forget you can save this map to your Google Maps and bring it with you! Make sure you're signed into your account and then simply click the star next to Rome below. Dan tossing a coin in the Trevi Fountain. If you know, you know. Have you been to Rome? Any favorite restaurants to add? We love to hear from you! Comment below or reach out directly.